The quality of Neocolor II Aquarelle Artists’ Crayons is universally acknowledged. Their excellent lightfastness, high pigment concentration, and adaptability to a variety of techniques have put them in a class of their own. Neocolor II Crayons are softer than colored pencils, denser than children’s wax crayons, and extremely responsive to a wet brush. Wet and dry techniques can be combined in the same drawing. Because of their strong pigmentation, light colors cover dark colors and vice-versa. Neocolors are soft enough to smudge with your fingertips, yet much firmer than oil pastels. Scrape off one or more layers of color to create an engraved sgraffito effect. They can also be combined with Caran d’Ache Pablo Colored Pencils. Best of all, they’re watersoluble. Individual Neocolor II Crayons measure 103 mm long × 8 mm diameter (4-1/16" × 5/16"). Wood Box Set of 84 — Housed in a beautiful, elegant wood box, this set makes a great gift for professional and amateur artists alike. It includes the same colors as the Set of 84. White, Light Gray, Gray, Black, Yellow, Golden Yellow, Orange, Orangish Yellow, Ochre, Raw Umber, Flame Red, Salmon, Brown, Vermilion, Russet, Scarlet, Carmine, Pink, Purple, Purple Violet, Lilac, Mauve, Violet, Periwinkle Blue, Ultramarine, Sky Blue, Prussian Blue, Cobalt Blue, Light Blue, Turquoise Blue, Malachite Green, Emerald Green, Jade Green, Grass Green, Dark Green, Yellow Green, Lime Green, Lemon Yellow, Light Olive, and Olive. Cobalt Blue Hue, Apricot, Flesh, Sahara Yellow, Fast Orange, Raw Sienna, Toledo Brown, Light Cadmium Red Hue, Saffron, Crimson Alizarin Hue, Night Blue, Chromium Oxide Green, Phthalo Green, Bright Green, Chinese Green, White, Silver Gray, Light Gray, Gray, Mouse Gray, Dark Gray, Grayish Black, Black, Yellow, Pale Yellow, Golden Yellow, Orange, Orangish Yellow, Golden Ochre, Ochre, Olive Brown, Vandycke Brown, Raw Umber, Flame Red, Salmon, Cinnamon, Brown, Vermilion, English Red, Russet, Burnt Sienna, Scarlet, Salmon Pink, Carmine, Pink, Purple, Purple Violet, Lilac, Mauve, Violet, Royal Blue, Periwinkle Blue, Indigo Blue, Ultramarine, Sky Blue, Sapphire Blue, Prussian Blue, Cobalt Blue, Light Blue, Turquoise Blue, Malachite Green, Greenish Blue, Turquoise, Bluish Green, Veronese Green, Emerald Green, Jade Green, Moss Green, Dark Green, Yellow Green, Lime Green, Lemon Yellow, Light Olive, Olive, Canary Yellow, Blue, Ruby Red, Light Beige, Beige, Sepia, Charcoal Gray, Bronze, Silver, and Gold. 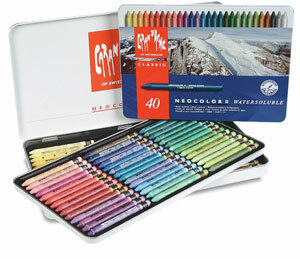 Neocolor II is a water soluble artist crayon made from high quality, lightfast pigments. They are softer than colored pencils and denser than wax crayons. When used on their own, Neocolor II Crayons are smooth drawing instruments great for sketching and filling in large areas. When used with water, they become an intensely vibrant and luminous watercolor paint. They can even be used to draw on glass, metal and other non-porous surfaces. Watch this video to see this unique artist crayon in action.